فروغی راد, سحر, خطیب زاده, مرضیه. (1393). تهیه سبز نانوذره های نقره مورد استفاده در جوهرهای رسانا به روش سونوشیمیایی. 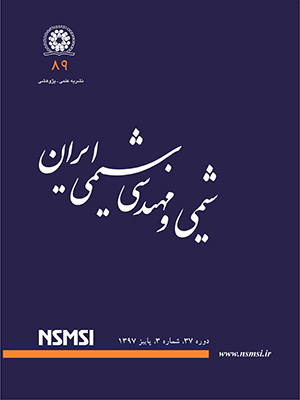 نشریه شیمی و مهندسی شیمی ایران, 34(1), 1-9. سحر فروغی راد; مرضیه خطیب زاده. "تهیه سبز نانوذره های نقره مورد استفاده در جوهرهای رسانا به روش سونوشیمیایی". نشریه شیمی و مهندسی شیمی ایران, 34, 1, 1393, 1-9. فروغی راد, سحر, خطیب زاده, مرضیه. (1393). 'تهیه سبز نانوذره های نقره مورد استفاده در جوهرهای رسانا به روش سونوشیمیایی', نشریه شیمی و مهندسی شیمی ایران, 34(1), pp. 1-9. فروغی راد, سحر, خطیب زاده, مرضیه. تهیه سبز نانوذره های نقره مورد استفاده در جوهرهای رسانا به روش سونوشیمیایی. نشریه شیمی و مهندسی شیمی ایران, 1393; 34(1): 1-9. Ruiz P., Macanás J., Muñoz M., Muraviev D.N., Intermatrix Synthesis: Easy Technique Permitting Preparation of Polymer-Stabilized Nanoparticles with Desired Composition and Structure, Nanoscalereslett, 6: 343 (6pp) (2011). Zhanjiang Z., Jinpei L., Synthesis and Characterization of Silver Nanoparticles by a Sonochemical Method, Rare Metal Materials and Engineering, 41(10): 1700-1705 (2012). زمان خان، حسام؛ آیتی، بیتا؛ گنجی دوست، حسین؛، تجزیه فتوکاتالیستی فنل به وسیله نانوذرات روی اکسید تثبیت شده بر بستر بتنی، نشریه شیمی و مهندسی شیمی ایران، (3) 31: 9-19 (1391). Lu J.P., Chen F.C., Lee Y.Z., Ring-Edged Bank Array Made by Inkjet Printing for Color Filters, Display Technology 5: 162-165 (2009). Hebner T.R., Wu C.C., Marcy D., Lu M.H., Stum J.C., Ink-Jet Printing of Doped Polymers for Organic Light Emitting Devices, Applied Physics Letters, 72: 519-521 (1998). Minemawari H., Yamada T., Matsui H., Tsutsumi J., Haas S., Chiba R., Kumai R., Hasegawa T., Inkjet Printing of Single-Crystal Films, Nature, 475: 364-367 (2011). Wang C.W., Yang M.H., Lee Y.Z., Cheng K., Hybrid Stacked RFID Antenna Coil Fabricated by Ink Jet Printing of Catalyst with Self-Assembled Polyelectrolytes and Electroless Plating, Imaging Science and Technology, 51: 452-455 (2007). قلیزاده، اعظم؛ شاهرخیان، سعید؛ ایرجی زاد، اعظم؛ مهاجرزاده، شمس الدین؛ وثوقی، منوچهر؛، اندازه گیری گلوتامات با استفاده از حسگر زیستی بر پایه نانولوله های کربنی عمودی، نشریه شیمی و مهندسی شیمی ایران، (4) 32: 36-33 (1392). Singh M., Haverinen H.M., Dhagat P., Jabbour G.E., Inkjet Printing Process and Its Applications, Advanced Materials, 22: 673-685 (2010). Kamyshny A., Ben-Moshe M., Aviezer Sh., Magdassi Sh., Ink-Jet Printing of Metallic Nanoparticles and Microemulsions, Macromolecular Rapid Communications, 26: 281-288 (2005). Kosmala A., Wright R., Zhang Q., Kirby P., Synthesis of Silver Nano Particles and Fabrication of Aqueous Ag Inks for Inkjet Printing, Materials Chemistry and Physics:1075-1080 (2011). Lee I., Han S. W., Kim K., Simultaneous Preparation of SERS‐Active Metal Colloids and Plates by Laser Ablation, Journal of Raman Spectroscopy, 32: 947-952 (2001). Bogle K. A., Dhole S.D., Bhoraskar V. N., Silver Nanoparticles: Synthesis and Size Control by Electron Irradiation, Nanotechnology, 17: 3204- (2006). Kim D., Jeong S., Moon J., Synthesis of Silver Nanoparticles Using the Polyol Process and the Influence of Precursor Injection, Nanotechnology, 17: 4019-24 (2006). Zhu H.T., Zhang C.Y., Yin Y.Sh., Rapid Synthesis of Copper Nanoparticles by Sodium Hypophosphite Reduction in Ethylene Glycol under Microwave Irradiation, Journal of Crystal Growth, 722-728 (2004). Valodkar M., Modi Sh., Pal A., Thakore S., Synthesis and Anti Bacterial Activity of Cu, Ag and Cu-Ag Alloy Nanoparticles: A Green Approach, Materials Research Bulletin, 384-389 (2011). Kora A.J., Beedu S.R., Jayaraman A., Size-Controlled Green Synthesis of Silver Nanoparticles Mediated by Gum Ghatti(Anogeissus Latifolia) and Its Biological Activity, orgmedchemlett. : 2-17 (2012). Ziarati A., Safaei-Ghomi J., Rohani S., Sonochemically Synthesis of Pyrazolones Using Reusable Catalyst CuI Nanoparticles that was Prepared by Sonication, Ultrasonics Sonochemistry, 20: 1069-1075 (2013). Manoiu V.S., Aloman A., Abtaining Silver Nanoparticles by Sonochemical Method, U.P.B. Sci. Bull., 72 (2010). Darroudi M., Khorsand Zak A., Muhamad M.R., Huang N.M., Hakimi M., Green Synthesis of Colloidal Silver Nanoparticles by Sonochemical Method, Materials Letters, 66: 117-120 (2012). Tang X.F., Yang Z.G., Wang W.J., A Simple Way of Preparing High-Concentration and High-Purity Nano Copper Colloid for Conductive Ink in Inkjet Printing Technology, Colloids and Surfaces, A: Physicochem. Eng. Aspects, 360: 99-104 (2010). "ISO ISO/TS 27687:2008 Nanotechnologies - Terminology and Definitions for Nano Objects - Nanoparticle, Nanofibre and Nanoplate" (2008). "ASTM 2456-06 Standard Terminology Relating to Nanotechnology" (2012).